Wow! I've worn this ring for a week now and everyone compliments on it. It is simply perfect (heirloom quality). I can't rave enough about it. Plus the ring's got some really cool symbology. Thanks RareEarthds! Absolutely stunning ring. I've already received several compliments. Beautiful craftsmanship. I couldn't be happier. Just a quick note to say that I am extremely happy with the re-design that you came up with of my uncles pinky ring. You were all very easy to talk to, professional with a personal touch that you do not get from the larger companies. I would highly recommend you to anyone who is looking for something that is unique. A very pleasing experience from start to finish, a stunning result. You both made it easy to understand the whole process, and I just love my ring. "My wife lost her engagement ring and was understandably distraught. We wanted to replace it with a special ring & I was struggling to come up with something meaningful. I dreaded a "set piece" type of giving, all form and no substance. When we walked into Rare Earth we were "introduced" to may different stones of all types and prices. I say introduced because it was very personal and my dull appreciation was enlightened. When Jennifer told us about how they sourced their stones and gave us a particular story about an unusually shaped yet affordable sapphire, a sapphire which seemed endless through one particular facet, appreciation turned to enthusiasm. It was with some regret they sold it to us, the exchange was more like that of a puppy going to a good home. Having decided on the stone we had a thoroughly enjoyable time being guided by an expert designer and artist for the setting. For an innocent like me it was pleasure to have the sense of what we wanted respected and transformed into a unique piece. We were on the verge of buying a ready made ring from a jewellery shop. Having lusted after some beautiful pearls as a gift for my wife in their showroom, I took a chance and dealt with Rare Earth later from Townsville 3000 km away. The service was impeccable and prompt, the quality was better than I recalled in the display case and payment was made flawless and stress free for me. A perfect result for a beautiful string of pearls which my wife absolutely loves. Just brilliant! This is a family run business. The staff are very friendly and helpful. They have lovely pieces of jewellery, or you can design you own. These rings were designed by Bret and Heather (the clients). Therefore we have not posted a photo of the rings. Thank you Jennifer for the unique design of my ring. I have become very left handed and as excited as a newly engaged girl. The craftsmanship is beautiful. 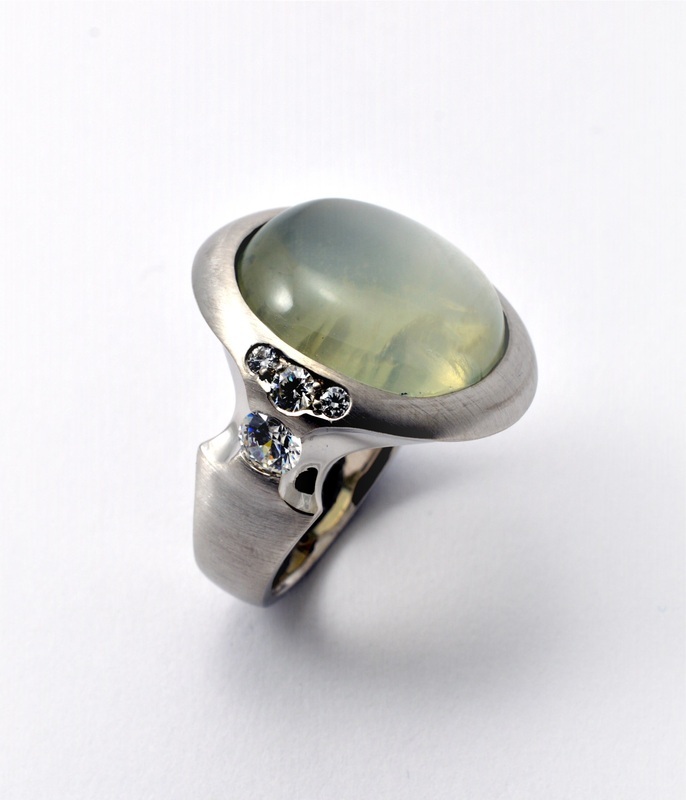 The moonstone has a soft glow and is enhanced by the satin finish of the surrounding silver. The saying " a thing of beauty is a joy forever" is certainly true. I wish such pleasure on all who enter your life.